Benefits of Dry Skin Brushing! We all know that exfoliating the skin creates radiant and vibrant looking skin but did you know dry skin brushing is an essential tool for stimulating blood and lymph flow, removing dead skin cells, stimulating hormone and oil glands, reducing cellulite, strengthening the immune system, stimulating the nervous system, toning your muscles, tightening the skin and last but definitely not last nurturing your body!!!? That’s a lot of benefits for something that is super easy and takes about 5 min to do! To start select a brush that has natural soft fiber bristles and a long handle for reaching your back. A brush can be purchased at any heath store, Wal-Mart or Shoppers Drug Mart. Brush your dry body each morning before you shower or bathe. Always start at the feet working towards the heart using circular motion. Brush all the way up your leg, then over the abdomen, buttocks and back. Spend more time on areas that have cellulite or very dry skin. 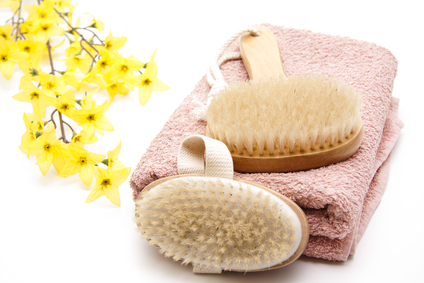 Brush very lightly on sensitive areas like breasts and your tummy and more firmly on elbows and soles of your feet. When you reach your arms, begin brushing at your fingers working your way up towards the heart. Brush your shoulders and chest downwards towards the heart. The only area where your will brush away from the heart is your breast … bush in a circular motion towards the armpit. Do not brush anywhere you might have a rash, cut or wound. Once you are finished brushing proceed to your shower or bath. If taking a shower you can further stimulate the lymphatic system and improve circulation by using the hot/cold therapy. Once you have showered/bathed dry off and massage pure plant oil into the skin such as coconut, almond or cocoa butter. You will feel rejuvenated and ready to take on the day!